I’m fascinated by Erwin McManus‘ latest move. 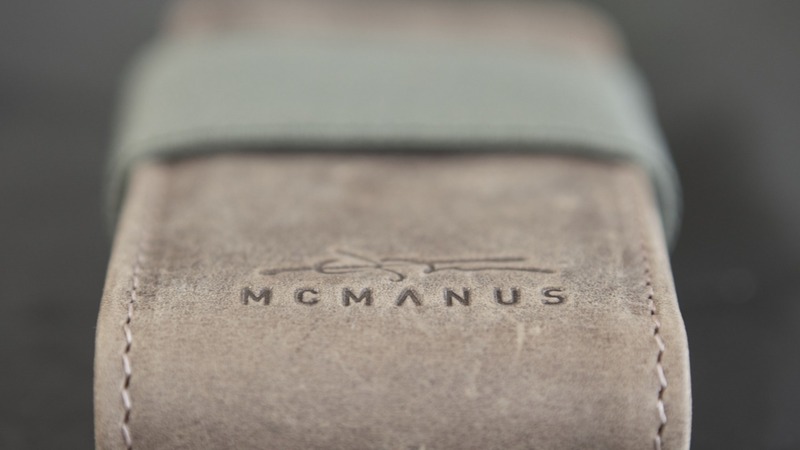 He’s started a fashion/design label – MCMANUS – producing jackets, wallets, bags, iPad holders, and other accessories. Erwin is a brilliant speaker, author and is Lead Navigator of influential LA Church MOSAIC. I’ve been greatly informed and encouraged by him. Erwin, why start a label? To create. To express things in my soul that were longing to come out. And to integrate story and beauty and bring meaning to life. So is this an extension of your Mosaic ministry, like writing books, or a whole other thing? All of it is an expression of what’s stirring in our soul. But Mosaic is an expression of all of us who serve there, and McManus is directly an expression of my personal journey. So is this what incarnational mission looks like in LA? Yes, and that question lets me know you get it. But not only LA, I’m a New Yorker as well, and I’m also a Parisian. This is an incarnation into the world of art, story, and creativity. Art is not bound by geography. What motivates your approach to design? Three words: beauty, story, and meaning. Our narrative is: ‘heroism is a style’. I love the styles expressed in culture whenever heroism is required. There is an elegance and masculinity reflected, and I want to shape the story people are in and provoke their most heroic selves and lives. I also strive to blend style and utility. I am a traveler and adventurer and the bags especially must work for the explorer and pioneer in all of us, they’re meant for travel. And craftsmanship matters – the collections are intended to reflect the person for whom what they carry matters to them. What would you say to someone who sees this as totally consumeristic? To start a company in the middle of a recession is the most practical and tangible way to be a part of the solution. Many of my friends were losing their jobs because things were so tough. I wanted to do something that created jobs and wealth for good people who would do more good in the world with the money they earned. The best way to do more good is to give more resources to good people. Good and generous people always make the world better. I love creating jobs for good people. I believe in work and entrepreneurship. To begin my company was far more risky than staying in the non- profit sector. Everyone it seems wants to be funded to do good but somehow generating wealth is evil. Besides, no one is obligated to buy my products. There are those for whom our brand resonates with their values. We make out products for them. They’re our tribe! But doesn’t this just add to the image-consious myth of personal identity already too prevalent in the West? We all live in a mythology. My work is raw and honest and calls us to be real and true to ourselves. We are destroying the unhealthy need to hide behind fashion, and instead allowing fashion to be an expression of our true selves. My line is masculine because I am. I felt a need for a masculine narrative that blended ruggedness and romance. It’s funny that the Anglo Saxon and German/Dutch side of our culture would often find it a waste of money to pay more for something beautiful when the practical would do; and the French and Latin side would consider it a waste of money to spend funds on something that isn’t beautiful and only functional. I know these are generalisations, but they tend to be consistent. I am a Latin through and through. I was raised with a value for timeless beauty. My first 45 (record) was of Beethoven and Liszt. There is nothing practical in their music. Their work only has value if beauty is essential and has intrinsic value on its own. And do we eat to survive only, or to enjoy as well? There’s is no pleasure or beauty required, but to enjoy a great meal makes us feel alive. We are enhanced. Jesus didn’t turn the water into a cheap bottle of $5.00 wine, but the best wine ever tasted. Why have we convinced ourselves that junk is more spiritual, and that creating beautiful things is out of God’s will. Everything we make or create or purchase is an extension of our self – a reflection of our identity. This is an even more important reason to enter this field. Someone is going to be informing our identity. Everything I create affirms the human spirit. Everything I design has the intent of provoking heroism. Every story we tell and film we make elevates the human story and calls us to our best selves. Who informs the story we are in? Whoever tells the best story shapes the culture and creates the future. 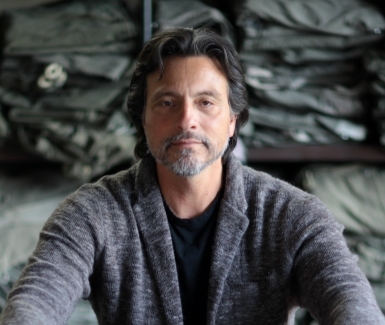 I assume MCMANUS abides by ethical production values? All of our products are American made! Designed, developed, and produced completely in the USA. This is an important part of our story. We work in downtown LA in what is known as the artist district. 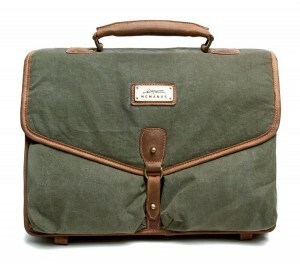 Our bags were initially made of repurposed WW2 materials. Our initial inspiration was the era of WW2 heroism and fashion. We’ve expanded beyond those now, but we carry that inspiration forward. We began with an interpretation of this historic period which I love and continue to be inspired by. So you hope to see more of this kind of venture? I hope one day what I am doing is a normative expression of our faith and community. I am not rare or uniquely talented, I’m just tenacious and unwilling to live a lesser life. I have to ask why is it that instead of cheering each other on, and celebrating each others uniqueness and creativity, we move more easily to judgment and condemnation? We’ll continue to lose our most gifted people and our most unique voices if we insist everyone conform to our expected approaches and norms. I hope to pave a path for the truly talented and gifted artisans who love Christ and have never felt affirmed or empowered to pursue a life of art, story, and beauty. The tribe of Jesus should be the worlds best storytellers, creators of beauty, and interpreters of the human journey. Wow, this is super interesting and thought provoking, thanks Tim. I like that the products are ethically and locally made. This interview reminds me of a fashion magazine in which a celebrity is approached by a perfume company or fashion line to ‘design’ a range of products. And the company is capitalising on the fame and fans that the celebrity already has. Also, Erwin said ‘everything we purchase…is an extension of ourself.’ This is a very strong statement which sounds similar to a consumerism manifesto to me. Conversely, it’s fantastic to see people who are ‘public Christians’ excelling in business and the creative world. I can say that I see this a lot, in Australia especially – criticism often in the guise of critique. Sure, lets ask the questions, but lets be careful not to analyse the spirit out of things. He inspires me to continually count the cost of my spiritual journey and I love his diversity and what he is creating through his life & in the life of others. Keep laying it down Erwin! Very expensive stuff…I’d like to know why the prices are so high? What are the reasons?Economics and whatever else are sure in play here. However I do like his way of thinking and think it’s cool seeing him express himself outside ministry and preaching! Great interview Tim. Really appreciate it. “Heroism is a style”? That was a clanger. But what I hear is that the intiative reflects him as a person. I get the picture that he is the entrepreneur, not the designer as such. I’d be interested to hear more about where the actual designers and artisans are in the process. Otherwise it can seem as if the brand guy is the creator, and I’m quite sure that Erwin would credit and applaud all of the others who were part of it. I am put off by his narcissism as evidenced by the over-exposure of his name, his elitism as a ‘citizen of the world’, and his shameless self-promotion. He is NOT a New Yorker, and I can assure you that the French do not regard him as a Parisian (to assert this is to show his ignorance of the French ethic.) He changed the name from “Temple Bags” (which he never adequately explained but prominently displayed in several Mosaic videos and interviews) to “McManus”, with the obligatory romanticism of ‘re-purposed” WWII canvas. It’s pure, unadulterated marketing, and as they said during, WWII “baloney’. I find him neither masculine nor heroic, and him saying it don’t make it so.